The Multi-Feed RM100 is a turn-key nutrient injection system for applications where concentrated fertilizer solutions are injected and mixed simultaneously. Dual manifolds and sequential micro-injection separate incompatible fertilizer concentrates while achieving precision accuracy. The injector is suitable for nutrient management in greenhouse vegetables, flower crops, research facilities, and indoor and outdoor production operations. As a complete injection solution, it can be used for in-line injection and for filling and maintaining dilute storage tanks. The Multi-Feed RM uses the advanced nutrient control technology of the Argus Titan control system, enabling the operator to program fertilizer recipes as part of the irrigation schedule. Feed formula constituents and overall feed strengths can be automatically adjusted to local conditions and cropping objectives. Depending on your requirements, the Multi-Feed system can provide anything from a single-tank formulation to many separate fertilizer recipes and feed strengths on the same irrigation system. Full single-element dosing options are available. 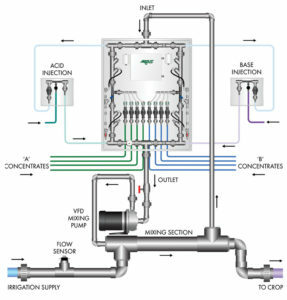 This schematic provides an overview of the Multi-Feed System. The process begins by configuring your feed recipes from the available stock concentrates connected to the injector. The Argus system can support up to 64 recipes on a single irrigation system. In each recipe, you can choose simple injection ratios from specified stock tanks, or you can enter target values in parts per million for each recipe element. It will locate the required elements in the available stock tanks, calculate the amounts to inject for the current flow rate, and automatically deliver each recipe when required. Once the recipes are configured, you simply specify them by name in your irrigation schedules. EC and pH targets for each recipe are tracked to ensure accuracy and provide a basis for automatic feed-strength correction, alarm monitoring, and quality assurance. 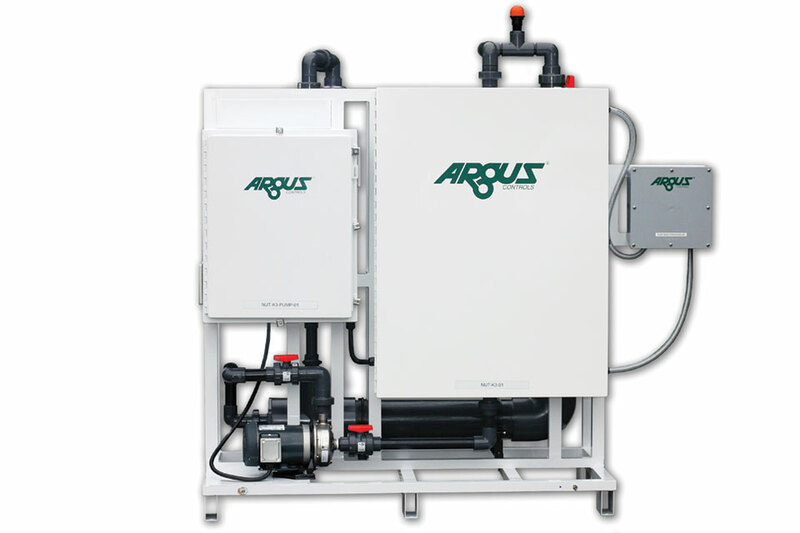 With Argus Feed Forward intelligence, precision dosing is achieved at all design flow rates. Multi-feed systems use Venturi injectors to draw the fertilizer concentrates into the mixing line to achieve a desired fertilizer concentration. The motive flow needed to operate the injectors is provided by an included variable frequency pump that circulates and mixes the concentrates within the Multi-Feed unit. Metering valves are used to provide precise amounts of concentrate for the current recipe and flow rate. For more information, go to ArgusControls.com.